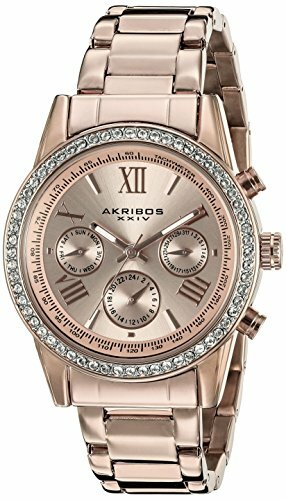 A true testament of modern style, this beautiful AKRIBOS XXIV Women's timepiece features a 36mm rose gold tone case with a Swarovski crystal studded bezel. This brilliant ring of sparkling stones frames a matte finish dial that is home to hand-applied Roman numeral and stick markers. Inside this elegant beauty is a prestigious ISA Swiss quartz movement that includes day of the week, date, and 24-hour functions. It is finished with a rose gold tone steel link bracelet with a polished finish! This store offers the best price for Akribos XXIV Women’s AK872RG Round Rose Gold Dial Crystal Accent Three Hand Quartz Rose Gold Tone Bracelet Watch, great deal!